The parish of Costessey is located on the western outskirts of Norwich. The modern settlement of New Costessey occupies the southeastern quarter of the parish. Old Costessey is located in the north and is a more or less a linear settlement that follows the line of the River Wensum. There are a number of scattered farms and in the southwest there are extensive sand and gravel quarries, an industrial estate and the Royal Norfolk Showground. The northern parish boundary follows the sinuous path of the River Wensum. Other parts of the boundary follow roads, field boundaries or other landscape features. The River Tud and its shallow valley pass though the centre of the parish. The A47 Norwich Southern Bypass clips the southwestern corner of the parish and the A1074 (the old A47) passes through the south. Quite a lot of fieldwalking and metal detecting has taken place within Costessey parish. As modern settlement and gravel quarrying covers almost two thirds of the parish, this work has tended to focus on the locations where there is open land (such as along the River Wensum, along the River Tud or in the southwest). As a result, the distributions of artefacts and sites may reflect this more than past human activity. A large number of flint artefacts of prehistoric date have been found in Costessey. They have been gathered in the areas where fieldwalking and metal detecting has concentrated, in gardens in the modern settlements and during fieldwork ahead of development. The earliest evidence for human activity in Costessey are two Palaeolithic flint handaxes (NHER 28712). They were found in a garden close to River Tud and the centre of the parish. 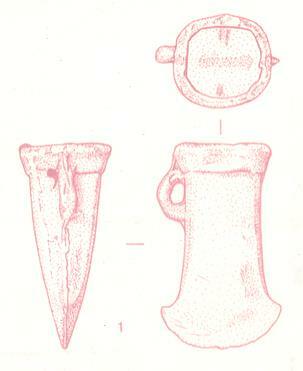 Mesolithic flint artefacts have been found on at least two sites. Those recovered from known locations were all discovered close to the River Wensum. An undated circular enclosure (NHER 18432) is located close to the confluence of the Rivers Tud and Wensum. It has been suggested that it may be comparable to the Neolithic henge at Arminghall (NHER 6100). Neolithic or possible Neolithic flintwork has been found in all of the areas that have seen fieldwalking and metal detecting. The same is true of Bronze Age or possible Bronze Age flints. Two possible burnt mounds have been recorded, both on the northern bank of the River Tud. The three undated ring ditches are known in the parish could be Bronze Age barrows; two are between the two rivers, whilst on is on sloping ground in the south of the parish. Excavations at the Costessey Park and Ride site discovered Bronze Age features (NHER 33842). A hoard of Late Bronze Age metalwork (NHER 16398) was discovered in the south of the parish, close to three natural mounds where a lot of prehistoric flints have been found. Two Bronze Age copper alloy objects have been collected close to the rivers. A Late Bronze Age knife has been found in the north of the parish, whilst a Late Bronze Age socketed axe (NHER 22539) found near the River Tud may have been redeposited from an unknown site. Iron Age pottery has been recovered in two locations in the southwest of Costessey parish. One Iron Age coin (NHER 25624) has been found in the parish. It is a coin of Cunobelin of the Trinovantes and was discovered in the north of the parish, very close to the River Wensum. Two possible Roman roads are thought to have passed through the parish. One (NHER 5244) is thought to have followed linked the area around Bishop Bridge in Norwich to Bawburgh. This was probably joined by the second (NHER 15768) in New Costessey. A pit (NHER 29047) containing a lot of Roman pottery and debris from a pottery kiln has been excavated and suggests that there would have been a pottery kiln or kilns in Costessey. It was located in the southwest on some of the highest ground in the parish. Roman artefacts have been found during fieldwalking and metal detecting. Most have been discovered in the northeast of the parish alongside the River Wensum, with a few findspots dotted in the southwest and amongst the areas of modern settlement. Early Saxon material has only definitely been found on one site (NHER 25624) in the parish. Pottery was recovered from a findspot located in the arc of the Wensum, to the north of the medieval church. Middle and Late Saxon pottery has also been found on the site. Middle Saxon and Late Saxon objects have been collected three further sites, all of which are close to the River Wensum and north of the River Tud. Finds include coins of Aethelred II, Cnut and Edward the Confessor. Numerous medieval and post medieval finds have been collected in more or less all the locations where metal detecting and fieldwalking have taken place. Costessey appears in the Domesday Book as ‘Costesseia’. This is an Old English name meaning ‘Cost’s Island’. It is possible that the island part may refer to the block of land between the Rivers Wensum and Tud. In 1086 Costessey was held by Count Alan. Estates in Bawburgh, Brandon Parva, Honingham, East Tuddenham, Appelthorp, Yaxham, Baskenea, Flockthorpe, Weston Longville, Felthorpe, Flordon and Middleton were valued with it. St Edmund’s Church (NHER 7912) is located at the northern end of Old Costessey village. It is a medieval church with later additions and restorations. In the west of the parish is St Walstan's Well (NHER 7886). This was a medieval holy well and is traditionally thought to be where St Walstan's hearse was stopped for the second time. It dried up after 1750. Park House (NHER 12394) is a 16th or 17th century house. 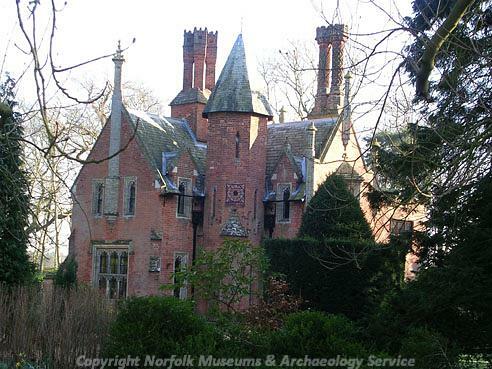 Located in Costessey Park, it was either originally a predecessor to Costessey Hall (NHER 7913) or a dower house associated with it. Costessey Hall itself was first built in 1564. During the 19th century it was greatly extended and extravagantly rebuilt in a Tudor style. It was partly demolished between 1910 and 1922 and fell into ruins. St Mary’s Tower, Eastwood Lodge, Roundhouse, Costessey Lodge, Beehive Lodge and two hydraulic rams were all built for the owners of the Hall. Post medieval buildings in the parish include those at Church Farm, Riverside Cottage, 25-27 West End Street, 86 West End Street, 64 The Street and 68-70 The Street. Of these, the last two may have medieval origins. The Round Well (NHER 7917) is a 19th century obelisk. It may have been built by French prisoners of war. A watermill (NHER 7904) was built in Old Costessey during the 19th century but burnt down in 1924. A nearby 19th century windmill (NHER 18205) also does not survive. There was a brickworks in the northwest of the parish and two brick kilns in the parish (one in the east and one in south). Two lime kilns are known. In 1882 century a railway line from Norwich City Station to Cromer (NHER 13584) was opened. It passed through the eastern part of the parish, close to the River Wensum. The route of the railway is now used as part of a long distance foot and cycle path. Costessey Hall was used by the army during World War Two and a landing strip for aircraft was laid out in front of it. A Liberator bomber crashed into a gravel pit in 1942 (NHER 7883). Immediately after World War Two the site of the present Royal Norfolk Showground served as an airport (NHER 29535). David Robertson (NLA), 19 September 2005. Gage, E.G., 1990. Costessey Hall, a retrospect of the Jernegans, Jerninghams and Stafford Jerninghams of Costessey Hall, Norfolk (unpublished). Mills, A.D., 1998. Dictionary of English Place-Names (Oxford, Oxford University Press). http://www.norfolkmills.co.uk/Watermills/costessey.html. Accessed 19 September 2005.
http://www.norfolkmills.co.uk/WindmillsN/costessey%20postmill.html. Accessed 2 February 2006.